Well, I do like Nazareth’s market, but I was ultimately going to see friends. The date of Eid al-Fitr, the holiday that ends Ramadan, is determined in the most traditional way — based on the sighting of the new moon. Thus they hadn’t known the exact date more than a day in advance, and we hadn’t planned around it. But there’s a certain charm in seeing this bustling city stop entirely. The day had started off with omens of things to come. I love taking the group taxis — moniot sherut — to and from Nazareth, because they are by far the quickest, easiest way to travel. But there were none — apparently because all the drivers are Muslim. So we caught a group taxi to Afula instead, and from there a bus to the outskirts of Nazareth. On the 10-minute walk into the city center, we passed a few open bakeries, many more closed ones, and a handful of elderly men clutching Muslim prayer beads. We headed up the hill, past one of my favorite greengrocers (closed) and then the Church of the Annunciation (the Catholic one — the Eastern Orthodox have their own a few blocks away). 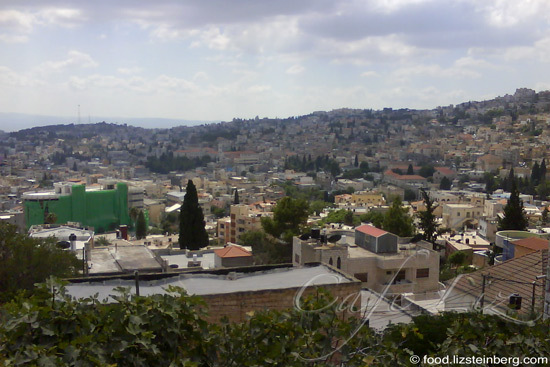 We passed under the gate into Nazareth’s market, which is usually bustling with people, kitchenware and delicacies. Complete silence. Filtered daylight reflected off closed metal shop doors and pavement tiles. If it weren’t for the smell of freshly ground coffee creeping out from behind a few storefronts, you wouldn’t even have known this was a market. Continuing up the road, we made our way to Jida’s house just as her family was eating lunch. Her mother Teres had made three platters of vegetables stuffed with spiced meat and rice, a show of expertise reflecting hours of painstaking labor — bottle squash, miniature eggplants and lemony grape leaves no thicker than my pinkie. A hole smaller than a marble was the only sign the squash and eggplant had been expertly hollowed out. For Eitan there were deep-fried sambusak — deep fried bundles of yeasted dough, cheese and zaatar crafted like miniature croissants. For dessert there were cookies the neighbors made for Jida’s brother’s wedding, including rosewater-scented ghraibeh and ring-shaped date cookies, an Easter specialty (but not only) due to their resemblance to Jesus’ crown of thorns. Nazareth’s Muslim residents have adopted these cookies for Ramadan, Jida’s sister commented. And finally, coffee with cardamom, with the cardamom added after the coffee was prepared, as opposed to some premade blend. 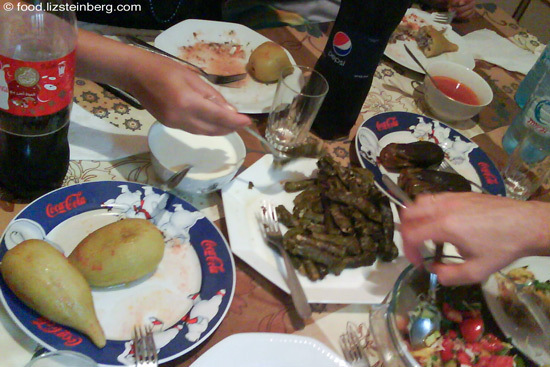 Traditional Arab cooks have very specific ways of preparing every dish, as Jida pointed out. You won’t see a lot of variation or experimentation. Nazareth food in particular tends to be not very spicy, and like Jida’s mother, most cooks there spice their food with cinnamon, nutmeg and pepper. According to some Jewish traditions, bottle squash are one of the symbols on the Rosh Hashanah table: Kara’a, sh’ikara’a roa gzar dinenu, may our evil sentences be torn up. 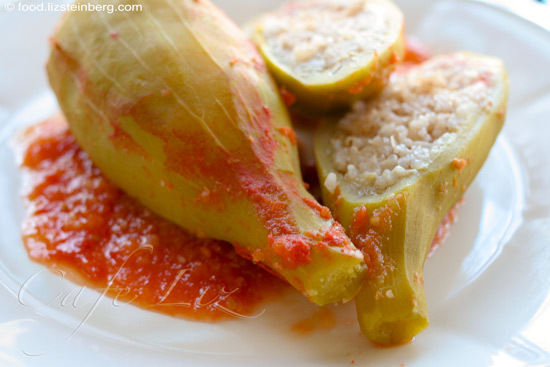 They’re also a favorite for stuffing in Arab communities in northern Israel. This is their season; aside from the markets in Nazareth, you can also find them in Jerusalem’s Mahane Yehuda and Damascus Gate markets, and at a few stands in the Carmel Market, among others. 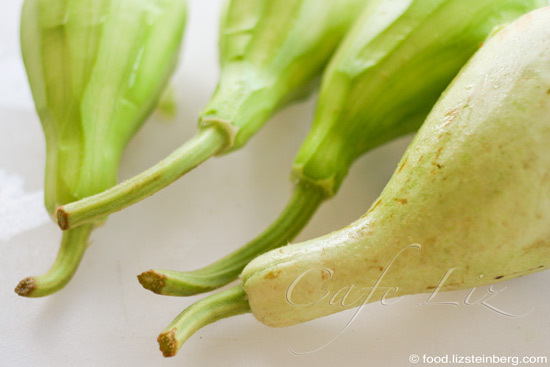 Jida and her family prefer slightly larger squash and eggplant for stuffing, about the length of your hand. 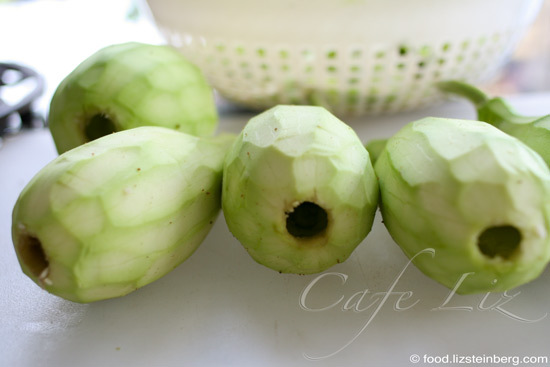 The bottle squash need to have their bitter peel removed, but don’t peel too deeply and remove too much squash, Jida’s sister noted. Her family hollows out the squash from a hole in the base, since they like to leave the fleshy neck intact; other people remove the neck and hollow out the squash from the top. They fill their squash with a mixture of rice and cooked ground beef, and cook them in a broth of blended, strained tomatoes. The straining removes skin and seeds, and makes the gravy very smooth, but I chose to skip this and leave my gravy thicker, as Jida suggested. I also added the squash innards back into the gravy. 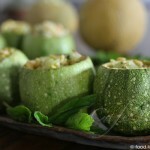 Recipe based on Teres’ stuffed squash; I came up with the measurements. Prep time: 1.5 hours. Cook time: 1 hour. Gently peel the squash, trying to remove only the bitter outer skin. Don’t cut too deep — you’ll see that the squash get paler inside the deeper you peel. Remove the stem, too. Hollow out the squash with a zucchini corer: Pierce the squash at the base, where the flower bud used to be, and carefully scoop out the inside (don’t pierce through the sides). Once I remove the first cylinder of squash from the center, I find it easiest to work with a scooping motion, inserting the corer at a sharp angle and scraping from the top down the sides. Let the rice soak for 10 minutes. 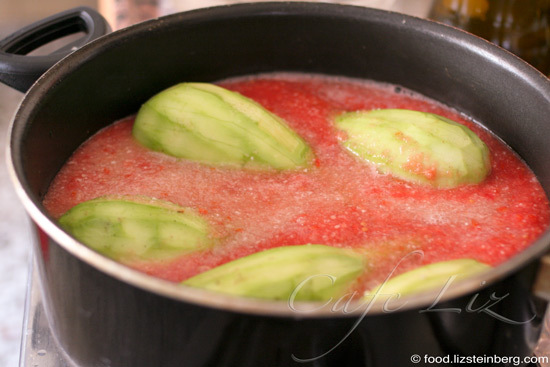 Meanwhile, blend the tomato into a pulp. Blend the insides removed from the squash in with the tomato. Drain the rice, and mix with the spices, 1/2 teaspoon salt and olive oil. Fill the squash until they’re about 2/3 full, within 2-3 centimeters of the top (you can see how full they are if you look inside them while holding them up to the light — you can see the shadow of your finger outside the squash so long as it’s above the level of the rice, which is opaque). I found it useful to use the coring tool to scoop the rice into the squash, since it is the same size as the hole. Arrange the squash in a pot, pour the tomato pulp on top, add the lemon juice and the final 1 teaspoon of salt, and cover with water until about 1 centimeter of squash is above the water. Bring to a boil and simmer for an hour. 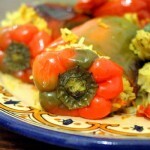 Abbie’s lovely post on kareh’ah and a quicker recipe for the squash. 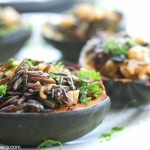 8 Responses to "Stuffed bottle squash, Nazareth style"
I love any kind of stuffed squash! This looks amazing. Great story to go with it as well. Thanks, Katherine! I wonder if you can find them in Be’er Sheva, too. An interesting variation 🙂 I’ve never had it without meat, but I’m sure it was still nice. Did you know that you can have this meal with yoghurt in addition? Not cooked, just on the side. Since you make it without meat, yoghurt isn’t a problem, right? Good job Liz! First time I read your blog and you have the exact recipe I’m looking for. I’ll take that as a sign to subscribe to your RSS feed. Thanks for a good story and a desired recipe. Believe it or not, I don’t think not using meat makes too much of a difference. And this way, Eitan can find out what he’s missing 😀 It was lovely seeing you guys.